As the days remaining in my semester abroad continue to dwindle and I now have only about a month left in Milan, I’ve found myself reflecting upon my time spent here. I feel that my time in Italy has been transformative to my world perspective, and I know this experience will stick with me for the rest of my life. On a more local level, though, there are some places in the city of Milan that I have come to love, and I know I’ll miss them when my plane takes off and I leave the city behind. In honor of my semester winding down, here are some of the great places in Milan I will miss most. 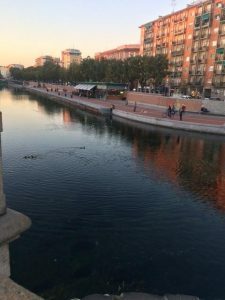 I am fortunate enough to both live and go to school very close to the Navigli Grande. Construction of massive canal is estimated to have began in Milan around 1258, and it once served as a means of transportation of essentials for Milan like livestock and food, as well as for heavy materials like the stone used to construct Milan’s famous Duomo. Nowadays, the canal is no longer in service as a vital transportation system, but still provides a beautiful waterfront to the city of Milan. I have been so lucky to be able to experience concerts, chocolate festivals, aperitivos, and simply quiet moments alone all on this historic canal. The Colonne di San Lorenzo is almost impossible to miss, because it looks so vastly different from the usual architecture in Milan- it is sixteen marble columns left over from Roman times guarding a piazza in front of a church. It provides visitors to Milan with an idea of what many other Italian cities look like, and just how different they are in juxtaposition to Milan’s modern aesthetic. In the warmer seasons, the courtyard serves as a hangout spot for young people to get together and lounge outside. The courtyard exists in a mecca of some amazing take away food that people bring to the piazza to enjoy with drinks and their friends- personally, the space is just steps away from one of my favorite falafel restaurants in all of Milan! 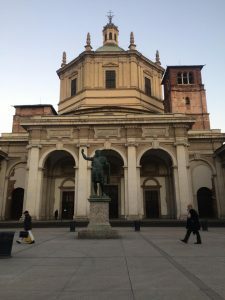 Oh, and while you’re there, it’s certainly worth peeking inside the Basilica di San Lorenzo, which serves as a backdrop to all the summer fun. As my school and the main reason for my time in Italy, NABA was sort of my rock when I first got here. It gave me a space to make friends with other students who had traveled all the way to Milan to study fashion in it’s global capital. At NABA, I’ve made some amazing friends, been inspired by professors and lessons, gained invaluable knowledge on the field I love, and felt I had a home in a busy and foreign city. 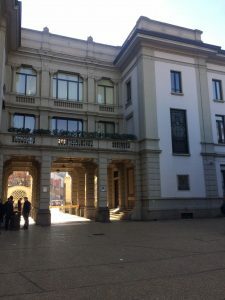 NABA’s campus became to me like a reassuring oasis in the otherwise chaotic city of Milan- and I’m so grateful for everything it’s helped me accomplish! Jocelyn is a Fall 2017 SAI Milan student from Lasell College.